There are times when the observer does not start the shot at the prescribed time for various reasons. For example, the observer may struggle to find the body due to cloud cover. 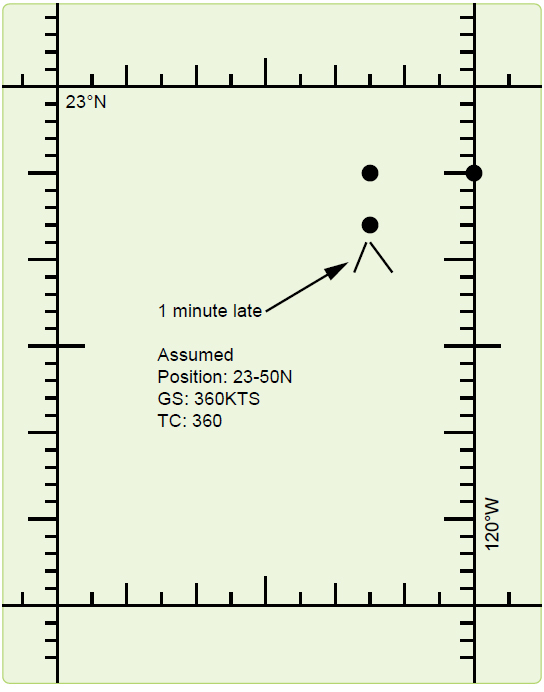 If a shot is taken off time, you can use the FEAST (Fast EAST) rule: a shot taken too fast or too early has the assumed position moved 15′ of longitude east for each minute early to compensate for body motion. [Figure 12-16] Apply the reverse of the FEAST rule for late shots (move the assumed position west). This adjusted position is then advanced or retarded for track and GS to account for motion of the observer, applying the same concept used in the three-LHA method. [Figure 12-5] This technique for solving motions is also discussed in the Celestial Precomputation category. Figure 12-16. Corrections for off-time shooting. Figure 12-5. Plotting three LHA. You will occasionally make errors in your precomputations. Possibly the most common would be an extraction error of the GHA or math error while computing the LHA. If one of these numbers is incorrect, then all the extractions from the Pub. No. 249 would be based on erroneous information, and the result would be an LOP error. Fortunately there is a way of compensating for this type of error without having to reenter the table and retrieve the correct data. This method is called the Longitude Adjustment Principle (LAP). 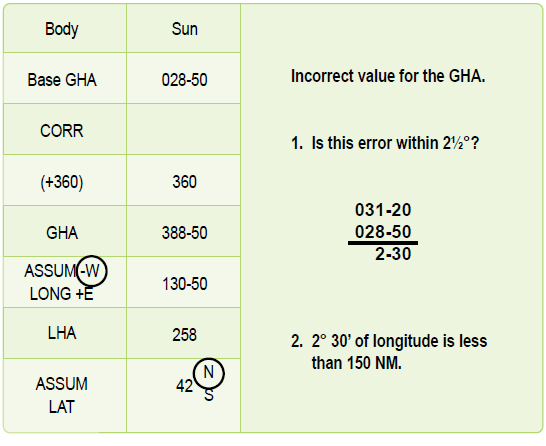 You need only adjust the assumed longitude (up to 2½°) to correct for a GHA extraction error or a math error. Moving the assumed position beyond the 2½° induces some error in the plotting LOP. 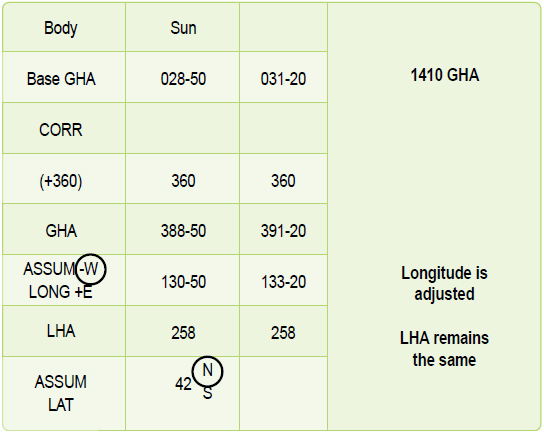 Suppose you wanted the GHA for 1410Z, you extracted the value for 1400Z and applied it to the longitude. [Figure 12-17] The resultant LHA was used and the precomp completed before you realized your error. 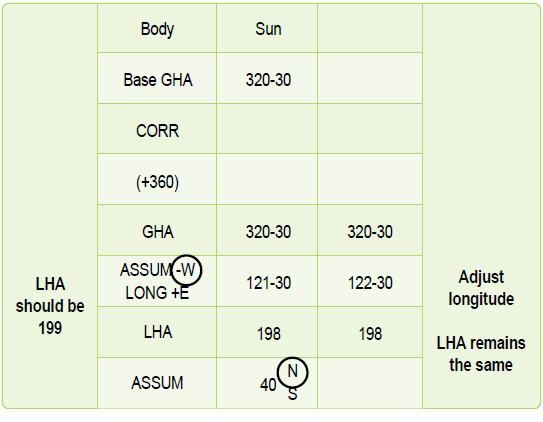 To do the LAP first, extract the correct GHA (031–20), keep the old LHA, and adjust the longitude so that the math is correct. [Figure 12-18] A math error can occur in solving for the LHA. 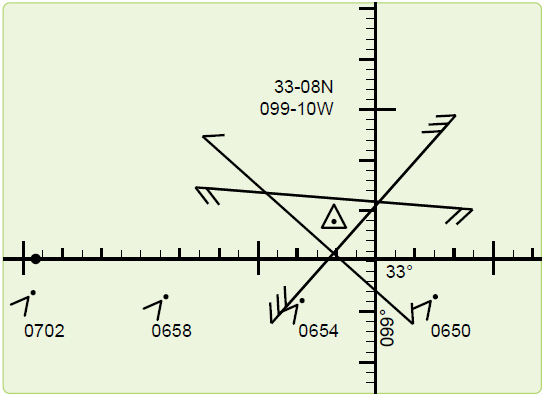 [Figure 12-19] Once you have corrected the precomp, use the adjusted longitude for your assumed longitude to plot the LOP. Figure 12-17. LAP using incorrect GHA. Figure 12-18. LAP using correct GHA. Figure 12-19. LAP correcting a math error.